This is the best book cover for the book that I found. Wish I could snag a copy with this cover someday. I really don’t have a system for discovering new books. I’m not one of those people who scours the web for new good reads, checks out the what’s popular on every bookstore type. Most of the stuff I read were just books I found scattered on Powerbooks (i.e. The Girl Who Kicked the Hornet’s Nest–it was only after about 2 months since I finished the third book that I learned it was a trilogy– and Para Kay B), and things I happen to pick up at secondhand bookstores and at book sales. 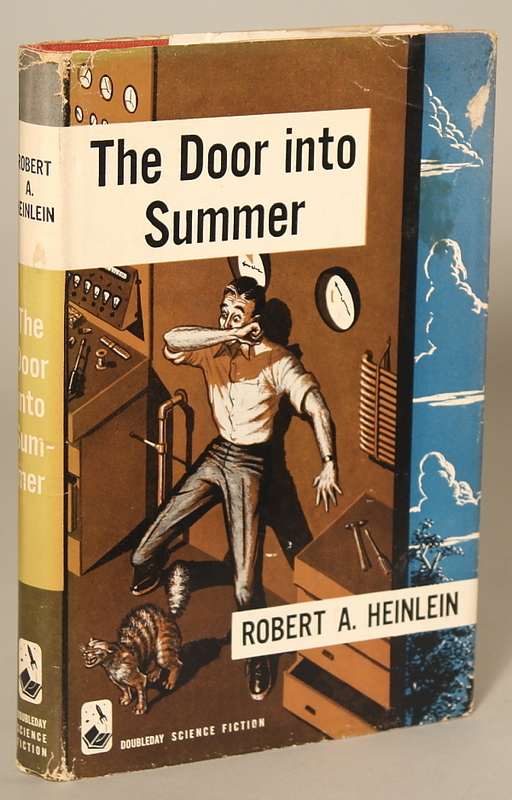 The Door into Summer, however, is the favorite book of one of my English students and he just keeps talking about it, and since I’m also into science fiction, I finally checked it out. The worst part of reading “past” science fiction novels is that the “future” is now. All of the things that are happening in Heinlein’s year 2000 is far from happening, even in 2012. The book talks a lot about robots since Dan is a mechanical engineer, and the robots of today are a long shot away from doing what Heinlein imagined–well, as far as public knowledge goes, anyway. And there are a bajillion other things he got wrong about the year 2000: they still haven’t found a way to eliminate the cold virus and while we do have dishes that lets the food stay warm until forever, it’s not used in everyday life. And I can find a dozen more flaws in the book–like the fact that the book is dedicated to ailurophiles, I hate cats, and that it has a creepy love story which I won’t talk about because spoilers–but I enjoyed it anyhow. Maybe it’s because I have a soft spot for time travel stories which, ultimately, is what the book really is about. And it’s kind of nice to take a break from all the dystopic future books and have a hopeful, cheery, and optimistic one. Heinlein’s future isn’t exactly Disney, Meet the Robinsons style, but I believe this future is the one that will eventually get there. It is an extremely readable book. It’s also very short since I finished it overnight. This is my first Heinlein book and it made me want to read more of his works. Who knows, maybe he would get there on top of my list with Sidney Sheldon, Mary Higgins-Clark, and David Zindell. In fact, after I googled him, I believe that there’s a big chance of that happening. If you do happen to decide to read the book, will you give me your take on Dan’s love story? Whatever the truth about this world, I like it. I’ve found my Door into Summer and I would not time travel again for fear of getting off at the wrong station.